Journeys East is an emerging educational online web project; video and image database; and starting point for documentary, creative media and installation based projects, centered around a film and photographic resource collated during travels in Tibet, Yunnan and Sichuan, China, and south east Asia. Organising and making this resource of around 100 hours of video and thousands of photos available to other practitioners/art practitioners, researchers, museums and scholars opens opportunities for collaboration, scholarship and creative practice. The archive features footage shot at some of the most renowned sites of Chinese and Tibetan Buddhism, and features Buddhist and Taoist temples, rituals, customs, artworks and performances; a unique record of threatened and changing cultures and ecologies. – Arnold Toynbee quoted in J.J. Clarke ‘Oriental Enlightenment’ (Routledge, 1997). Exploring the potential of digital media practice to represent and communicate core themes and concerns of Buddhist religious practice, culture and philosophy; and their role and place in contemporary society through the creative treatment of video and photographic material gathered first hand in fieldtrips to China and south east Asia since 2005, and the dissemination of the work into debate, public exhibition via film festival screenings and museum exhibition, and the generation of a paper for publication. Small hand held high quality video facilitated filming in locations and situations otherwise difficult and costly for traditional media production practices to capture, and access to lesser known sites of interest was facilitated through close support of Chinese speaking nationals. Whilst I am aware of historic collections of footage and imagery shot in these regions in the past, and which form the basis of a number of study collections, much contemporary filming and photography in this field has tended to be in the Buddhist and Himalayan regions outside of China itself, due to the previous historic and political contexts affecting access and travel in China and Tibet prior to the liberalisation and opening up of China during the past 20 years. Through the process of preparing the material for my own practice, I intend to catalogue and make available as a research resource the photographic and video archive which forms the basis for my own creative practice. Current digital technologies are facilitating a high quality film making style, acquisition of content and access which builds on the revolutionary leaps in film production so well documented since the French New Wave, which smaller and more mobile technologies enable. Exploiting these potentials alongside the opening up of China in the past twenty years, and increasing mobility which internal tourism developments have also enhanced throughout China, has given me the opportunity and access to film material in the context of a fast changing, developing Chinese cultural landscape; documenting changing Chinese openness of its own indigenous cultures; recording cultures and sacred sites which have been decimated during the Cultural Revolution of the 1960s, but which are being reinvigorated once more with a growing recognition of the importance by both populace and state, of the Buddhist, Taoist and Confucian traditions in Chinese society. This reinvigoration is not without its problems, sometimes it is tourism potential driving the redevelopment of sacred spaces, and sometimes internal political conflict is stalling developments. Some of the sites filmed are under dire threat, without urgent development, and my footage may sadly prove to become historic record, if neglect continues. In the case of some of my footage shot in Sichuan, the 2008 earthquake has since damaged some of the historic sites previously filmed. Whilst I am aware of historic collections of footage and imagery shot in these regions in the past, and which form the basis of a number of study collections, much contemporary filming and photography in this field has tended to be in the Buddhist and Himalayan regions outside of China itself, due to the previous historic and political contexts mentioned above. With a substantial amount of material shot – some 100 hours of video and thousands of photos, the necessity now is to collate this material, both as the first stage in developing further creative practice, and as a means of making this resource available to others. Journeys East is featured in the ‘Vision’ section of the Glasgow based Arts for Intercultural Dialogue Project, produced and edited by Sarah Potter & Dr Emily Munro, for the British Council – Intercultural Navigators Programme, 2010/11. 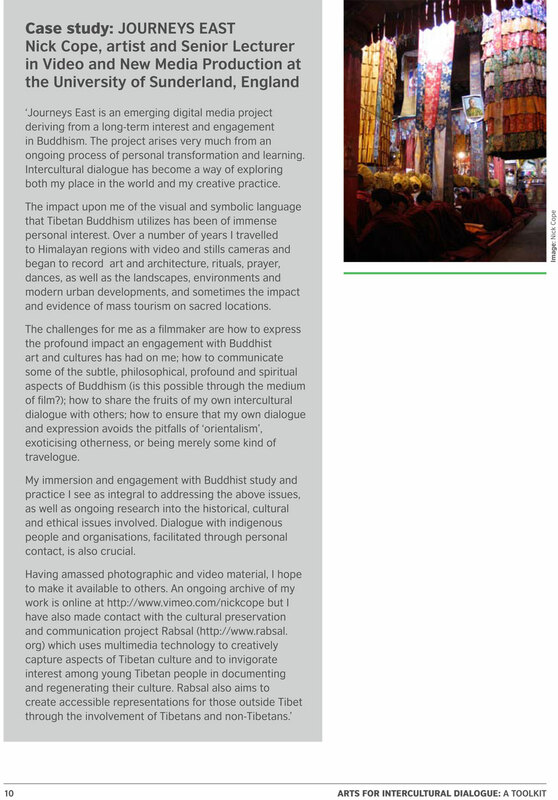 Nick Cope filming in Yunnan, China; Arts for Intercultural Dialogue: A Toolkit, p8. 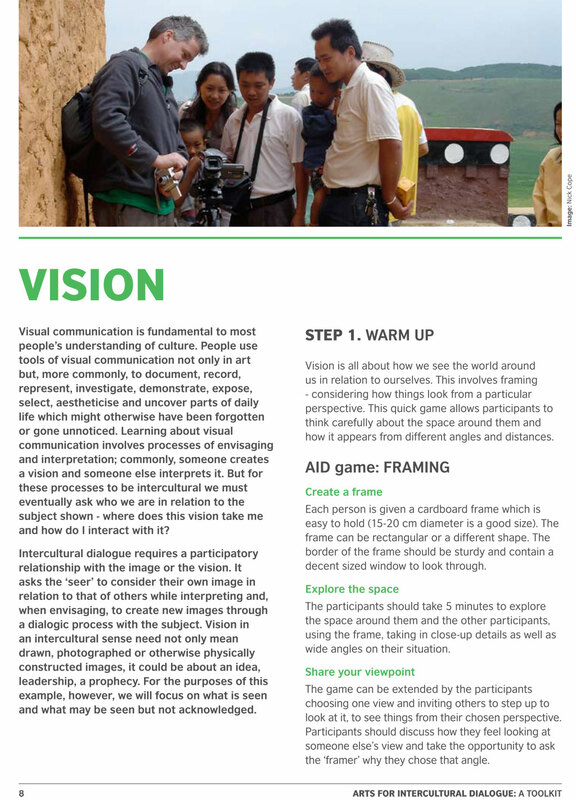 Arts for Intercultural Dialogue: A Toolkit, case study, p10. Due to concentrating on both my PhD and other collaborative projects prior to 2013, I am only just beginning to catalogue, develop, explore and edit material gathered since 2005. Currently two projects, in addition to the Intercultural Arts case study, have been developed from the material; a short film Miles Away in collaboration with musician Phil Thornton, and the installation Flags with composer Tim Howle. Journeys East acknowledges a debt to, and highly recommends, Harry Oldmeadow’s comprehensive study ‘Journeys East: 20th Century Western Encounters with Eastern Religious Traditions’ published by World Wisdom Books, 2004.